FREE FOUR ALL!! Fancy a signed Victorious t-shirt? Just email mizz@panini.co.uk with the name of the two characters who don't see eye-to-eye. Good luck!! 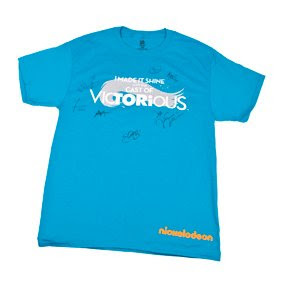 The signed "Victorious" t-shirt was most likely signed by the cast of "Victorious" during the "Victorious" casts recent trip to London, UK in October 2011, when Mizz Mag TV, the online television channel of Mizz Magazine on the video sharing and video hosting website YouTube, interviewed the cast of the Nickelodeon series "Victorious". Mizz Magazine's "Signed Victorious T-shirt Competition" is open to everyone. According to Nickelodeon UK's new "Prepare For An Awesome Night Of Premieres, This Friday On Nickelodeon" promo (below), Nickelodeon UK & Ireland and Nickelodeon UK HD will be devoting a whole Friday night to Nickelodeon UK premieres called "Awesome Night Of Premieres" on Friday 4th November 2011 from 5pm. As part of Nick UK's "Awesome Night Of Premieres" night, Nickelodeon UK & Ireland and Nickelodeon HD UK will be premiering the brand new "SpongeBob SquarePants" episode called "Big Sister Sam", in which Patrick Star's big sister Sam visits Bikini Bottom to see her brother, at 5.00pm (repeated at 6.00pm on Nick Replay UK), premiering a brand new sneak peek preview of the brand new Nickelodeon animated show "Kung Fu Panda: Legends of Awesomeness" (also known as "Kung Fu Panda: Legends"), which is based on the "Kung Fu Panda" movies, at 5.30pm (6.30pm on Nick Replay UK), and premiering the new "mega-movie" "Happy Feet" at 6pm (repeated at 7pm on Nick Replay UK). Awesome Shows, This Friday From 5! Thats right, hot off the Nickelodeon news desk, this Fri we have a brand new SPONGEBOB at 5pm, followed by a sneak peek of KUNG FU PANDA! Nickelodeon UK have also posted a sneak peek picture from the upcoming brand new animated Nickelodeon show "Kung Fu Panda: Legends of Awesomeness" on Nick UK's official Twitter page which you can view here. According to Nickelodeon UK's new "Awesome Night Of Premieres, This Friday At 5" promo, Nickelodeon UK & Ireland and Nickelodeon UK HD will be premiering and showing the brand new "mega-movie" "Happy Feet" on Friday 4th November 2011 at 6pm (repeated at 7pm on Nick Replay UK), as part of Nickelodeon UK's "Awesome Night Of Premieres" night. According to Nickelodeon UK's new "This Is A Brand New "Victorious" You Don't Want To Miss, Next Monday At 6, Only On Nickelodeon" promo (below), Nickelodeon UK & Ireland and Nickelodeon UK HD will be premiering and showing the brand new episode of "Victorious" titled "Helen Back Again", which guest stars Helen Ophelia Dubois (Yvette Nicole Brown) from the hit Nickelodeon show "Drake & Josh" as the new principal of Hollywood Arts performing arts high school, on Monday 7th November 2011 at 6pm (repeated at 7pm on Nick Replay UK). Victorious 'Helen Back Again', Allan Blatch from Allan Blatch on Vimeo. Brand New Victorious 'Helen Back Again' 30" promo edited, produced and written by Allan Blatch for Nickelodeon UK. Graphics by Pixel DNA; Voiced by Jenny Gannon, Audio by Jungle Group. In the brand new episode of "Victorious" called "Helen Back Again", when Principal Eikner resigns as principal of Hollywood Arts, Helen (from Drake & Josh) is hired as the new principal and decides to have every student re-audition in order for them to stay in the school. Despite a stellar audition with Andre, Tori is rejected, and the group tries to find a way to change Principal Helen's mind about rejecting Tori. Will they really let Tori walk away? Or will she shine once again? Victorious "Helen Back Again" at 8:30 P.M. ET/PT from Jessica Wilson on Vimeo. The official Nickelodeon UK website, Nick.co.uk, has also got an exclusive sneak peek Nickelodeon video clip from the "Victorious" episode "Helen Back Again" which features Jade West (Elizabeth Gillies) showcasing her dark, or darker, side in her scary re-audition tape to stay at Hollywood Arts which you can view here on the official Nick UK website. Excited for NEW Victorious 6pm! In tonights ep a new principle takes over Hollywood Arts & forces the gang to re-audition for their places! According to Nickelodeon UK's new ""Power Rangers Samurai" Premiere Week, Coming Soon, To Nickelodeon" promo (in high quality high-definition below), Nickelodeon UK & Ireland and Nickelodeon UK HD will be premiering and showing brand new episodes of "Power Rangers Samurai" every weekday at 5pm (6pm on Nick Replay UK) during a "Power Rangers Samurai Premiere Week" from Monday 14th November 2011 to Thursday 17th November 2011. Power Rangers Samurai Premiere Week Promo from Renato Straume Fogliani on Vimeo. Power Ranger Samurai Premiere Week from Renato Straume Fogliani on Vimeo. ...with brand new "Power Rangers Samurai"! In a whole week of explosive premieres. [...] battle which will decide once and for all who is the ultimate Samurai. VAMPIRE BEACH. A night that will haunt you forever. Vampires and ghouls stalk the park and Nickelodeon Land. The Pleasure Beach, Blackpool. 4 to 9pm. Nickelodeon to broadcast a new episode every day this week at 5.30pm [on NickToons UK]. The show has also been picked up by ITV and will go live on its channels early next year. Commissioned by Nickelodeon UK and with international broadcast partners such as Nickelodeon Australia, Teletoon Canada and RTE Ireland, the series was created and produced by Platinum Films. Platinum Films is a multi-faceted film and children’s television production company which develops programming to a global market. Canadian based studio Arc Productions is creating the animation for the series. Debbie Macdonald, VP programming director, Nickelodeon UK, said: “Matt Hatter Chronicles is a perfect balance of comedy and adventure with state of the art, cutting edge 3D animation, which our audience is now growing to expect with the explosion of high end 3D Cinema and the digital video gaming culture." Matt Hatter Chronicles is an adventure/comedy series. Matt was just an ordinary boy until he stumbled upon the Hatter family secret. The Hatters are defenders of a gateway to a different dimension, the Mutliverse. To save our world and the Multiverse Matt must battle and capture infamous villains from movie, myth and legend. According to the official Nickelodeon USA website, Nick.com, Nickelodeon USA is planning to show the "lost"/"banned" Halloween Nickelodeon Movie "Cry Baby Lane" this Halloween on Monday 31st October 2011 on Nickelodeon USA's TeenNick network (channel) as part of TeenNick's "The '90s Are All That" programming block as part of Halloween On Nickelodeon USA 2011. "Cry Baby Lane" is a made for TV Halloween Nickelodeon movie which premiered on Nickelodeon USA on the night of October 28, 2000. "Cry Baby Lane" was never re-aired or released on video (VHS) or DVD and was widely believed to be because of complaints from parents who found the film to be too scary and inappropriate for children, which the Nickelodeon network later confirmed was untrue. The movie was considered to be a lost film until 2011 when TeenNick announced plans to re-air "Cry Baby Lane" as part of TeenNick's "The '90s Are All That" programming block on October 31, 2011. "Cry Baby Lane" was filmed in Tontogany, Ohio, USA, and was produced by Albie Hecht and Jerry Kupfer. The editor was Doug Able, and John Inwood served as the director of photography. North American visitors to Nick.com can view a geo-locked video clip from the Nickelodeon Film "Cry Baby Lane" here on the official Nickelodeon USA website. AUCKLAND, NEW ZEALAND — Auckland-based New Zealand Mint has partnered with PFG Precious Metals, a division of PFGBEST, to manufacture, produce and distribute a limited edition four-coin set featuring characters from Nickelodeon’s global pop culture phenomenon SpongeBob SquarePants. The world’s most famous sea sponge, SpongeBob SquarePants, will be immortalized on a square, legal tender silver bullion coin, along with friends, Patrick, Gary, and Sandy. The set presents the SpongeBob SquarePants characters packaged in a unique treasure chest, complete with a certificate of authenticity issued by New Zealand Mint. For a limited time these one-of-kind coins can be pre-ordered through New Zealand Mint and PFG Precious Metals for US$279 (approx. NZ$350). Peter Thomas, director of business development for PFG Precious Metals, agrees. For more information and to pre-order, go to www.newzealandmint.com/spongebob or www.spongebobcoins.com. Shipping is scheduled to begin by mid-December 2011. About The Coins: The set includes four, 1-ounce silver legal tender bullion coins packaged in a unique treasure chest, reminiscent of one found in “Bikini Bottom,” where SpongeBob and his friends live The silver coins depict SpongeBob; his pet snail, Gary; his best friend, Patrick Star; and his friend, Sandy Cheeks, a squirrel. The obverse of the coin features The Raphael Maklouf effigy of Her Majesty the Queen Elizabeth II, sovereign of the commonwealth of Niue. Each coin in the set is struck from 1 ounce of pure bullion silver. No more than 100,000 coins for each design will be issued by New Zealand Mint. Nickelodeon, now in its 32nd year, is the number-one entertainment brand for kids. It has built a diverse, global business by putting kids first in everything it does. The company includes television programming and production in the United States and around the world, plus consumer products, online, recreation, books, and feature films. Nickelodeon’s U.S. television network is seen in more than 100 million households and has been the number-one-rated basic cable network for 16 consecutive years. For more information or artwork, visit http://www.nickpress.com. Nickelodeon and all related titles, characters and logos are trademarks of Viacom Inc. (NYSE: VIA, VIA.B). About New Zealand Mint: New Zealand Mint has been minting legal tender commemorative coins, gold bullion and medallions for more than four decades. As New Zealand's only precious metal mint and one of the first world mints to adopt the .9999 standard for gold coin purity, New Zealand Mint prides itself on high quality design and production work. In 2009, New Zealand Mint opened the Bullion Exchange, the first of its kind in New Zealand which offers a comprehensive service for buying and selling gold and silver bullion as well as on-site insured storage. Leading the way with innovative, colored, silver and gold commemorative coins, New Zealand Mint is known globally for quality and design excellence. New Zealand Mint also produces several ranges of jewelry that cater to many tastes and styles, including the Boh Runga and Trelise Cooper for New Zealand Mint collections. About PFG Precious Metals: PFG Precious Metals, a division of PFGBEST, is a full-service wholesale trading company. The website for more information about it is www.pfgpreciousmetals.com. PFG Precious Metals is a member of the Certified Coin Exchange, a dealer-to-dealer exchange connecting more than 350 U.S. coin dealers. The company sells gold, silver, platinum and palladium in the form of bullion bars and bullion coins. The majority of the bars and coins are fresh current year, straight from suppliers’ vaults. PFG Precious Metals services include buying and selling of precious metals, inventory hedging, qualified IRAs and the Gold and Silver Accumulation Program, and its dealers have more than 55 years combined experience in the financial services industry. Nickelodeon, SpongeBob SquarePants and all related titles, logos and characters are trademarks of Viacom International Inc. The Official Nick Jr. UK Website Unveils Halloween Clips For "Halloween On Nick Jr. 2011"
"Dora tries to cheer up her friend Little Monster as he doesn't have a Halloween costume". "Watch this video of the Bubble Guppies Halloween special episode airing on Saturday 29th and Sunday 30th October at 5pm on Nick Jr."
"Watch this exclusive video of the Team Umizoomi Halloween special episode airing on Saturday 29th and Sunday 30th October at 5:30pm on Nick Jr."
"Watch a video clip where DJ Lance Rock gives his friends Muno, Foofa, Brobee, Toodee, and Plex Halloween costumes". The official Nick Jr. UK website has also unveiled a exclusive competition which Nick Jr. Channel UK and Nick Jr. 2 viewers and NickJr.co.uk website visitors can enter by colouring in a Halloween-themed picture of Dora The Explorer wearing a Cat Halloween costume to be featured in NickJr.co.uk's "Dora's Halloween Gallery". The official Nick Jr. UK Facebook profile page has also put up an exclusive "Dora the Explorer" Halloween door hangers "Print and Cut Out" activity. According to Nickelodeon UK's new "Premiere Of The Brand New "Winx Club" Special "The Battle for Magix"" trailer (below) which is currently being aired on Nickelodeon UK, Nickelodeon UK and Ireland and Nickelodeon UK HD will premier and show the brand new special "Winx Club" episode called "The Battle for Magix" on Sunday 13th November 2011 at 9am (time to be confirmed by Nick UK). This November, the world of Winx is in danger. And it's up to one fairy to save us/it all. A brand new Winx Club special, "The Battle for Magix", coming the 13th of November, on Nickelodeon. Only five magical girls can save the universe! Nickelodeon's biggest stars lend their voices to the third of four specials following a group of super-fashionable fairies. Below are two sneak peek Nickelodeon video clips from when the brand new "Big Time Rush" Halloween holiday special episode called "Big Time Halloween" premiered on Nickelodeon USA in October 2010 as part of Nickelodeon USA's Halloween 2010 programming line-up. Nickelodeon UK and Ireland and Nickelodeon HD UK will premiere of the brand new "Big Time Rush" Halloween holiday special episode titled "Big Time Halloween", which guest stars Bro-bee from Nick Jr.'s "Yo Gabba Gabba!" on Sunday 30th October 2011 at 5:00pm (6pm on Nick Replay). The official Nickelodeon Italy/Nickelodeon Italia website, NickTV.it, has unveiled some thoroughly haunted Halloween-themed Nickelodeon goodies to download, including Halloween-themed Nickelodeon computer desktop wallpapers featuring "Spongebob Squarepants" (including one of Spongebob Squarepants dressed as a wicked witch, one of Spongebob Squarepants wearing a ghost "Trick Or Treat" (or "Nick Or Treat") Halloween costume, and two of Spongebob Squarepants dressed in a vampire Halloween costume), "Rugrats All Grown Up!" (Tommy Pickles in a vampire Halloween costume), "Edgar & Ellen", and "Dora the Explorer" (featuring Dora the Explorer dressed in a cat costume and holding a trick or treat candy/sweet container in the shape of a Halloween pumpkin), and PC screensavers, including one that features a Nickelodeon Halloween-themed scene from "The Fairly OddParents" (Timmy Turner in a Frankenstein costume and Cosmo and Wanda in the shape of spiders in front of the Turner's house). Did you know its Peppa Pig week on @NickJrUK? Nickelodeon has announced that its live-action shows Victorious and Big Time Rush are to go free-to-air this month on ITV's terrestrial and digital channels. ITV has picked up 33 episodes of Victorious, the show starring Victoria Justice, along with 49 episodes of Big Time Rush, which has become the highest-rated live-action series in Nickelodeon's 30-year history. The programmes, previously shown only on pay-TV, will be broadcast during the breakfast slots on weekend mornings on ITV1, and after-school slots in weekdays on CITV, as well as in high definition. Season one of Victorious launches on ITV's channels on October 30, and season one of Big Time Rush will break on the following day. "Our clients around the world look for top-performing programming which travels and resonates with kids no matter where they are and Nickelodeon's latest hits, Victorious and Big Time Rush, really have it all," said Caroline Beaton, the senior vice president of programme sales at Nickelodeon-parent Viacom. "I'm delighted that we're able to extend these two hit live-action series to even more audiences, this time across the UK, through our long-standing and fruitful partnership with ITV." Tina McCann, the managing director of Nickelodeon UK, said: "Victorious and Big Time Rush have been huge hits for Nickelodeon UK. Each features outstanding young talent who really engage with UK fans. "Both shows feature friendship, music, dance, fashion and aspirational lifestyle that really resonate with our audiences. We are delighted to be bringing these properties to a wider market." Jamila Metran, the programme manager at CITV, added: "We are very pleased to have secured Victorious and Big Time Rush for broadcast on CITV and ITV Breakfast. "The deal continues ITV's successful partnership with VIMN (Viacom International Media Networks) on past titles which include Drake and Josh and SpongeBob SquarePants." Nickelodeon live-action series Victorious and Big Time Rush are going free-to-air on ITV channels in the UK starting this month. The programs will be shown during peak viewing slots on breakfast weekend mornings on ITV1 and during after school slots on CITV, as well as in HD. Season one of Victorious launches on ITV’s channels this Sunday and the first season of Big Time Rush will follow on Monday. The latter became the highest-rated live-action series launch in Nickelodeon’s 30-year history. The deal furthers ITV’s partnership with Nickelodeon parent company Viacom on past titles such as Drake and Josh and SpongeBob SquarePants. The first two seasons of the live action shows will air on CITV and ITV breakfast. Nickelodeon has secured peak time viewing slots for Victorious and Big Time Rush across ITV's terrestrial and digital channels. 33 episodes of Victorious and 49 episodes of Big Time Rush will show on breakfast weekend mornings on ITV1 and after school slots on CITV, as well as in HD. The deal represents the continuation of the partnership between ITV and Viacom; CITV has previously aired Viacom shows like SpongeBob Squarepants and Drake and Josh. Caroline Beaton, SVP, programme sales, Viacom International Media Networks, said: “Our clients around the world look for top performing programming which travels and resonates with kids no matter where they are and Nickelodeon’s latest hits, Victorious and Big Time Rush, really have it all. Broadcasters across the globe have bought Victorious, Viacom-owned Nickelodeon's high school-set live action series. The music-themed show has gone to ORF (Austria), DR (Denmark), Telenica (Nicaragua), Venevision (Venezuela), Montecarlo TV (Uruguay) and Fiji Broadcasting (Fiji). TV Globo (Brazil), CiTV (UK), TF1 (France), Rai (Italy) and Vrak TV (Canada) are among others that have recently acquired the show. Sister Nickelodeon's live-actioner Big Time Rush has scored sales with TVE (Spain), Teletica (Costa Rica) and Telenica. RTM (Malaysia) and Fiji Broadcasting also bought the show from Viacom International Media Networks (VIMN). Elsewhere, teen fashion series True Jackson has found homes on Latin Americans broadcasters, while iCarly has gone to Network Ten (Australia) and Venevision. TVE has relicensed the latter until 2016 and new seasons will run on Mediaset (Italy), DR, RSI (Switzerland), CNBC-e (Turkey) and Vrak. Further deals have been struck with New Zealand, Brazilian, Colombian and Fijian broadcasters. The sales comes after VIMN's parent Viacom took a undisclosed majority stake in mixed martial arts promotion Bellator last week. It will begin running Bellator programming on male-skewed US cablenet Spike TV in 2013. This came after Viacom's deal with Bellator's rival UFC came to an end this year. UFC subsequently signed am alternative deal with Fox. Bucket and Skinner have been best friends ever since they were in their diapers learning to surf. The beach buddies may be as different as night and day but they have 3 goals in common: stay friends forever (check! ), always be near a beach (surf's up!) and never do anything that requires long pants (gnarly!). Their perfect day includes wicked waves, an epic taco and of course, meeting cute girls. But Bucket and Skinner quickly learn that avoiding a life of hard work is hard work! Bucket & Skinner’s Epic Adventures is a buddy comedy about two surfer dudes navigating the small trials of everyday life. When Bucket (Taylor Gray) attempts to win over the affection of classmate Kelly (Ashley Argota), his best bud Skinner (Dillon Lane) decides to nominate him as class President, inadvertently causing him to run against the super-popular athlete Aloe (Glenn McCuen). Unqualified and totally unfit for student council, Bucket is forced to team up with the Kelly’s younger sister, the precocious Piper (Tiffany Espensen), in order to save face and try to win the heart of his dream girl. According to Nickelodeon UK on their official Twitter page (@NickelodeonUK), Nickelodeon UK and Ireland and Nickelodeon UK HD will premiere the brand new episode of the hit Nickelodeon television series "iCarly" called "iOMG" during November 2011 (precise air date and time to be confirmed by Nick UK). will there be any new episodes of icarly in november besides iPity the nevel? @NickelodeonUK - Yes iOMG will also be here in November! Nickelodeon UK's Official Website Unveils Two Sneak Peek Video Clips Of "Fred 2: Night of the Living Fred"
Fred Figglehorn and John Cena team up. Nickelodeon children’s programmes Victorious and Big Time Rush are to air on ITV. The first two seasons of the live action series will air on the main ITV channel and children-aimed CITV Channel. 33 episodes of Victorious and 49 editions Big Time Rush will air as part of the weekend breakfast programming on ITV and in after school slots on CITV. Victorious has proved to be a top rating show for Nickelodeon while Big Time Rush is the highest rated live action series in the network’s 30-year history. Season one of Victorious launches on ITV’s channels on Sunday 30th October and Season one of Big Time Rush on Monday 31st October. Have an amazing, fun filled Christmas this year by visiting Nickelodeon Land at Pleasure Beach, Blackpool. Enjoy 12 days of Christmas at Nickelodeon Land, Pleasure Beach’s newest £10.3m attraction, where during the festive period, Nickelodeon Land will be transformed into a winter wonderland where you can meet all of your favourite Nickelodeon characters and even Father Christmas himself. To make this Winter Wonderland even more special, as you make your way to Nickelodeon Land you will pass through the Festive Walk. The Festive Walk features a selection of traditional wooden chalets selling a range of festive food, gifts and treats for the whole family. Whilst visiting, take a break with a spin on the ice! Entry to Nickelodeon Land also includes free ice-skating at The Arena, a ice skating rink found in the heart of the park. Children can also meet Father Christmas at Santa's Magical Winter Grotto and receive a free gift. Nickelodeon Land is suitable for all ages. Parents and children can enjoy a number of rides together including Diego’s Rainforest Rescue and SpongeBob SquarePants Bikini Bottom Bus Tour. Older thrill seekers can step aboard the Nickelodeon Streak or soar through the air on the Avatar Airbender. As well as enjoying all of the fantastic rides, guests can also rub shoulders with famous Nick characters such as SpongeBob SquarePants, and Dora the Explorer, shop in the UK’s only Nick Shop and dine in the beautifully designed Big Pizza Kitchen. For more information on all of Nickelodeon Land’s rides and attractions visit www.nick.co.uk/nickelodeonland. Nickelodeon Land’s 12 days of Christmas take place on 3rd and 4th December, 10th and 11th December and 17th to the 24th December from 11.00am to 4.00pm. Wristband prices are £12 for both adults & children when booked in advance on line and £18 for adults & children at the gate. This includes free ice-skating at Pleasure Beach Arena and free entrance to Father Christmas’s grotto for children 11 and under which includes a free gift. Visits on 24th December can only be booked online in advance. All online bookings include free car parking. For all online bookings or further information, please visit www.pleasurebeachresort.com. * Shouldn't that be "12 days of NickMas at Nickelodeon Land, Pleasure Beach, Blackpool" or "12 days of Nickelmas at Nickelodeon Land, Pleasure Beach, Blackpool"? NICKELODEON LAND'S 12 DAYS OF CHRISTMAS. Twelve rides, Santa's grotto, free ice skating (pay for skate hire), free parking (when booked online), festive walk. Nickelodeon Land, Blackpool Pleasure Beach, South Shore. 11am to 4pm. Also December 4, 10, 11 and 17 to 24 (December 24 online pre booking only). any clue when will a new episode of icarly air? In "iCarly" "iPity the Nevel", Nevel Papperman finds himself in a real "pickle" after an incriminating video of him verbally abusing a little girl in a supermarket is is posted online and makes him one of the most hated kids in the world. With nowhere else to turn he attempts to seek help to restore his reputation from the most unlikely source... his sworn enemies, Carly Shay and her friends. You can view Nickelodeon UK's new "Don't miss brand new "iCarly" "iPity the Nevel", coming in November, on Nickelodeon" trailer here. iCarly “iPity the Nevel,” premiering Saturday, March 19 at 8:00 p.m. (ET/PT) from NickPress on Vimeo. In iCarly “iPity the Nevel,” premiering at 8:00 p.m. (ET/PT), a video of Nevel yelling at a little girl surfaces on the Internet and everyone turns against him. At first, the iCarly gang relish in Nevel’s social demise but they begin to feel badly for him after he comes to them for help. The gang tries to restore Nevel’s reputation by encouraging him to apologize to the little girl for his bad behavior. Meanwhile, Freddie deals with a sudden wave of popularity from female fans after he stars as a hunky vampire in an online iCarly short film “Moonlight Twi-Blood.” Did he sink his teeth into more than he can chew? @NickelodeonUK - No plans to show it all on the channel yet, but some of the filming will b used later in year! @NickelodeonUK - No plans to show event on TV but bits of filming will be used around episodes, keep ur eyes peeled! will ther be more New Big Time Rush Episodes after Sundays new episode? @NickelodeonUK There will b new BTR [Big Time Rush] in Nov! There will be more new BTR in November, keep your eyes peeled and I'll let you know when! Dora and Boots are in their flower-filled spring forest with their friend, Unicornio, when suddenly a little rabbit pops out of a secret door hidden in the shrubs. All of the forest animals have chosen Unicornio as the King of the Enchanted Forest -- because he's kind, smart, brave and strong! There's just one problem: Unicornio's unsure and doesn't think he's any of those things! Dora and Boots will show Unicornio that he can be King as they travel to the Castle! We have an exciting week coming up on Nick Jr. Don't miss the 3-part special, Dora's Enchanted Forest Adventures starting on Tuesday. Nick Jr. is gearing up for Dora's Enchanted Forest Adventures, so why not play our brand new game http://www.nickjr.co.uk/play/dora/enchanted-forest-adventure/#! Catch new eps of the all singing all dancing Victorious this November, which follows Tori Vegas through her new and exciting life in a performing arts school. Catch all your favourite underwater friends this week on Nickelodeon in all new episodes! One of the brand new episodes of "SpongeBob SquarePants" which Nickelodeon UK and Ireland, Nickelodeon HD UK and Nick Replay UK is expected to premiere in November 2011 is called "Big Sister Sam", in which Patrick Star's big sister Sam visits Bikini Bottom to see her brother. 4/11/2011 5:00pm New SpongeBob SquarePants - Patrick's big sister Samantha comes for a visit in 'Big Sister Sam', and then in 'Perfect Chemistry', Sandy and Plankton bond over their shared love of science. Hooray hooray it's BRAND NEW @spongebob day! Today at 5pm! According to Nickelodeon UK's new "Don't miss brand new "iCarly" "iPity the Nevel", coming in November, on Nickelodeon" trailer (below), Nickelodeon UK and Ireland and Nickelodeon UK HD will premiere the brand new episode of the hit Nickelodeon television show "iCarly" called "iPity the Nevel" in November 2011 (precise air date and time to be confirmed by Nick UK). Update - Nickelodeon UK and Ireland and Nickelodeon UK HD will premiere the brand new episode of the hit Nickelodeon television show "iCarly" called "iPity the Nevel" in on Friday 11th November 2011 at 5.30pm (6.30pm on Nickelodeon Replay UK). "Kung Fu Panda: Legends of Awesomeness" - Nickelodeon UK will premiere the brand new Nickelodeon animated show (NickToon) "Kung Fu Panda: Legends of Awesomeness" on Nickelodeon UK & Ireland and Nickelodeon UK HD on Friday 4th November 2011 at 5:30pm (repeated at 6.30pm on Nickelodeon UK's time shift channel Nick Replay), and on NickToons UK the same night (Friday 4th November 2011) at 7:35pm. "Kung Fu Panda: Legends of Awesomeness", which is based on the "Kung Fu Panda" movies which are made by DreamWorks Animation, will tell the continuing adventures of Po the Panda "as he trains, protects, fights, teaches, learns, stumbles, talks too much, and geeks out as the newest hero in the Valley of Peace. Now living in the barracks with the Furious Five, Po will have to take on his many new responsibilities, his many new adversaries, and his many old pounds in the continuing education and adventures of the Dragon Warrior. And kick some serious boo-tay. Yeah, that goes without saying. For being the Dragon Warrior is not a destination, it’s a journey. Unfortunately for Po, most of that journey is uphill". According to Nickelodeon UK's new "Nickelodeon's brand new show "Life with Boys", coming in November, on Nickelodeon" trailer (below), after the sneak peek of "Life with Boys" that Nickelodeon UK and Ireland and Nickelodeon UK HD gave viewers on Friday 21st October 2011, Nick UK and Ireland and Nick UK HD will fully premiere the brand new live action series "Life with Boys" in November 2011 (precise air date to be confirmed by Nickelodeon UK). Nickelodeon UK's brand new live-action show "Life with Boys" follows Tess Foster (Torri Webster) as she copes living in a home with just boys, her father and her three brothers. With the help of her best friend, she pulls through. The cast of "Life with Boys" stars Torri Webster as Tess Foster, Michael Murphy as Sam Foster, Jake Goodman as Spencer Foster, Nathan McLeod as Gabe Foster, Sandy Jobin-Bevans as Jack, and Madison Pettis as Allie. According to Nickelodeon UK on their official Twitter page (@NickelodeonUK), Nickelodeon UK and Ireland and Nickelodeon UK HD will premiere the brand new episode of the hit Nickelodeon television show "iCarly" called "iOMG" during November 2011 (precise air date and time to be confirmed by Nick UK). Johnny Cupcakes is also scheduling to release the second wave (release 2) of their Nickelodeon-inspired clothing line called the "Johnny Cupcakes X Nickelodeon Collaboration" on Saturday 5th November 2011 (Firework Night/Bonfire Night/Guy Fawkes Night in the UK). According to Nickelodeon UK's new "Premiere Of The Brand New "Winx Club" Special "The Battle for Magix"" trailer which is currently being aired on Nickelodeon UK, Nickelodeon UK and Ireland and Nickelodeon UK HD will premier and show the brand new special "Winx Club" episode called "The Battle for Magix" on Sunday 13th November 2011 at 9am. According to Nickelodeon UK's new ""Power Rangers Samurai" Premiere Week, Coming Soon, To Nickelodeon" promo (below), Nickelodeon UK & Ireland and Nickelodeon UK HD will be premiering and showing brand new episodes of "Power Rangers Samurai" every weekday at 5pm (6pm on Nick Replay UK) during a "Power Rangers Samurai Premiere Week" from Monday 14th November 2011. The official Nickelodeon UK website, Nick.co.uk, has got an exclusive sneak peek Nickelodeon video clip from the "Victorious" episode "Helen Back Again" which features Jade West (Elizabeth Gillies) showcasing her dark, or darker, side in her scary re-audition tape to stay at Hollywood Arts which you can view here on the official Nick UK website. According to the high quality high-definition (HD) streaming video of Nickelodeon UK's new "A Squidward Shaped Mystery" episodic trailer (below), Nickelodeon UK & Ireland and Nickelodeon UK HD will be premiering and showing a brand new episode of the hit animated Nickelodeon show ("NickToon") "SpongeBob SquarePants" on Friday 11th November 2011 at 5:00pm (repeated at 6pm on Nick Replay UK), followed by the brand new episode of popular Nickelodeon live action show "iCarly" called "iPity the Nevel" at 5.30pm (repeated at 6.30pm on Nick Replay UK). Brand New Spongebob Squarepants, Allan Blatch from Allan Blatch on Vimeo. "A Squidward Shaped Mystery" written, edited and produced by Allan Blatch for Nickelodeon UK. Voiced by Gary Martin, Graphics by Lucky Cat Post and audio by the Jungle Group. ...and it's not the [Krabby] Patties. To find out what happened to Squidward, no Pattie will be left unturned. Brand new Spongebob, next Friday at 5, followed by "iPity the Nevel", only on Nickelodeon! According to the online TV guide Digiguide, Nickelodeon UK and Ireland and Nickelodeon UK HD will premiere the brand new episode of the hit Nickelodeon live action television show "iCarly" called "iPity the Nevel" on Friday 11th November 2011 at 5.30pm (repeated at 6.30pm on Nick Replay UK), straight after a brand new episode of the popular animated Nickelodeon show ("NickToon") "SpongeBob SquarePants" at 5.00pm. When a video of Nevel yelling at a little girl surfaces on the internet, Nevel becomes hated by everyone. After he begs them for help, the gang works to restore his honour. You can find out more information about Nick UK and Ireland and Nick HD UK premiering the brand new episode of "iCarly" titled "iPity the Nevel", including sneak peek video clips, here. According to Nickelodeon UK's new "Nickelodeon's brand new show "Life with Boys", Starts In November, On Nickelodeon" trailer (below), after the sneak peek of "Life with Boys" that Nickelodeon UK and Ireland and Nickelodeon UK HD gave viewers on Friday 21st October 2011, Nick UK and Ireland and Nick UK HD will fully premiere the brand new live action series "Life with Boys" on Monday 21st November 2011 (precise air time to be confirmed by Nickelodeon UK). Its a movie marathon this weekend! Snuggle up on the sofa and catch SpongeBob SquarePants, Fred, Fred 2 [Night of the Living Fred] & The Boy Who Cried Werewolf! According to Nickelodeon UK's new "It's "Kung Fu Panda: Legends of Awesomeness"" promo (below), after the sneak peek of "Kung Fu Panda: Legends of Awesomeness" that Nickelodeon UK and Ireland and Nickelodeon UK HD gave viewers on Friday 4th November 2011, Nickelodeon UK will fully premiere the brand new animated Nickelodeon show "Kung Fu Panda: Legends of Awesomeness" on Nick UK and Ireland and Nick UK HD on Monday 21st November 2011 (air time to be confirmed by Nickelodeon UK). It's the brand new show "Kung Fu Panda: Legends of Awesomeness". Starts the 21st of November, on Nickelodeon. According to the high quality (HQ) streaming video of Nickelodeon UK's new "Fast And Furious New Episode Of "SpongeBob SquarePants"" episodic trailer (below), Nickelodeon UK & Ireland and Nickelodeon UK HD will be premiering and showing the brand new episodes of the hit animated Nickelodeon show ("NickToon") "SpongeBob SquarePants" called "Drive Thru" and "The Hot Shot" on Friday 18th November 2011 at 5:00pm (repeated at 6pm on Nick Replay UK), followed by the brand new episode of popular Nickelodeon live action show "iCarly" called "iOMG" at 5.30pm (repeated at 6.30pm on Nick Replay UK). Brand New Spongebob Episode 154, Allan Blatch from Allan Blatch on Vimeo. This episodic Spongebob Squarepants promo was written, produced and edited by Allan Blatch for Nickelodeon UK. Voiced by Gary Martin and mixed by The Jungle Group. The yellow square just wanted to be popular. ...he'll find out it's no [...] to be a rebel without a cause. In this fast and furious new episode, Spongebob's heading for one thing - trouble! Next Friday at 5, followed by iOMG, only on Nickelodeon! According to the high quality (HQ) streaming video of Nickelodeon UK's new "Fast And Furious New Episode Of "SpongeBob SquarePants"" episodic trailer (just above), Nickelodeon UK & Ireland and Nickelodeon UK HD will be premiering and showing the brand new episode of the hit Nickelodeon live action show "iCarly" called "iOMG" on Friday 18th November 2011 at 5.30pm (repeated at 6.30pm on Nick Replay UK). In the brand new episode of the popular Nickelodeon show "iCarly" titled "iOMG", Sam is as normal as can-be until Freddy starts hanging out with his friend Brad. Then Sam suddenly wants to hang out with them. During a lock in at Ridgeway High School during which students pull all-nighters and work on finishing projects, Brad and Freddy test out their new mood reader application for the PearPad called "Mood Face" on Sam. The app says Sam is "in love". Then, Carly and Freddy try to hook Sam up with Brad. Then Freddy discovers who Sam really is in love with. It's NEW NEW NEW this Friday on Nickelodeon! We are treating you to NEW SpongeBob, NEW iCarly & awesome NEW show Life With Boys! Second on the ALL new line up, I know all you iFans have been waiting for this! @iCarly iPity The Nevel at 5.30pm! Finally on all new day, u get a SNEAK peek at awesome new show Life With Boys. How does Tess Foster cope living with 3 brothers & her dad?! According to NickToons UK's new "New Episode Of "SpongeBob SquarePants"" lower third/strap promo graphic (the text that NickToons UK occasionally displays at the bottom-left of the screen during programmes to advertise that NickToons UK will be showing brand new episodes of shows soon and upcoming programming events on NickToons UK), NickToons UK will be showing the "brand new to NickToons UK" episodes of "SpongeBob SquarePants" "Krusty Dogs" and "The Wreck of the Mauna Loa" on Monday 14th November 2011 at 5.00pm (6.00pm on NickToons UK Replay). SpongeBob's brand new culinary sensation threatens the Krabby Patty's dominance in 'Krusty Dogs', and in 'The Wreck of the Mauna Loa', SpongeBob and Patrick discover a wrecked pirate treasure ship. Squidward becomes friends with a new neighbour in 'New Fish In Town', and then in 'Love That Squid', Squidward gets ready to go out on a date, and SpongeBob assists him. This November, Sheen Is Back. Brand new episodes of Planet Sheen, next Monday to Thursday at 4.30, only on NickToons! This month is PACKED with new Power Rangers, Life With Boys, Kung Fu Panda, iOMG etc ! BTR will b coming soon, dont worry! According to the official Nickelodeon UK websites official Nick UK schedule section, Nickelodeon UK and Ireland and Nickelodeon HD UK will be repeating the brand new episode of the hit Nickelodeon live action show "iCarly" called "iOMG" on Saturday 19th November 2011 at 2.30pm and 8.25pm (repeated at 3.30pm and 9.25pm on Nick Replay UK), with more chances to catch up on the latest new episode of "iCarly" ("iOMG") on Sunday 20th November 2011 at 3.30pm and 8.30pm (repeated at 4.30pm and 9.30pm on Nick Replay UK). New iCarly - iOMG: The gang spends the night finishing their projects at Ridgeway during the annual school lock-in. Carly and Freddie start to suspect that Sam might have a crush on their new friend Brad. According to NickToons UK's new ""The Penguins of Madagascar" Premiere Week" promo/trailer (below, with transcript), Nickelodeon UK's Nicktoons channel, NickToons UK and Ireland, will be premiering brand new episodes of the animated Nickelodeon series "The Penguins of Madagascar" during ""The Penguins of Madagascar" Premiere Week", every weekday from Monday 28th November 2011 to Thursday 1st December 2011 at 6.30pm. [Commercial on television] Are you being treated badly by your boss? Does he kick you when your down? Does he treat you like your just a piece of the furniture? ...You will learn how to stand up for yourself and get some respect! Let the power of the Penguin help you get what you really, really want! The Penguins of Madagascar Premiere Week, next week Monday to Thursday at 6.30, on NickToons! Season 2 will be amazing! Theyre currently in filming, but the secrets will all b revealed in 2012! Will keep you all posted! Hey House of Anubis fans, yes season two will b coming! Currently v.busy filming, so keep ur eyes peeled for news on when itll b on screen! Can you please tell me the date when House of Anubis is coming back on? @NickelodeonUK - There will be news in 2012! do you know when house of anubis is coming in the UK?? @NickelodeonUK - It will launch in 2012, keep ur eyes peeled for dates! Also, according to British Actor and Nickelodeon UK writer, producer and director David Kangas on his official Twitter page (@kangas911), it sounds like there may also be a brand new second series of the Nickelodeon UK made show "Anubis Unlocked", which goes behind the scenes and talks to the cast of "The House of Anubis", and is presented by Nickelodeon UK presenters Jamie Rickers and Anna Williamson. On our way up to Anubis @JamieRickersGWR @annawilliamsTV @make_up_jo @adamjohnparker sitting next to us is Mr Sweet!! Paul Anthony Barber!!! @kangas911 - couldn't say [...]. HOA 2 is in production, ready for broadcast in 2012 keep watching and who knows there could be a 3rd. Back oop north for continued shooting on Nickelodeon's/Lime Pictures House of Anubis! Ed Pugh & Angelo Abela...legends!! Like zoiks Scoob! It's another early one shooting House of Anubis!! Series 2 is on it's way very soon!! Well done 4 HOA, Mr D has their been any news about The House of Anubis and the Five of the Magical Sword yet? @kangas911 - no word. Are you expecting a part in that? will do, BTW when is the season 2 premiere date in our country Mr D? Hi, when do you think HOA 2 will premier in the US? Are the episodes edited while the show is being filmed or after? Director of Original Production for Nick UK (Director of Original Production for Nickelodeon UK) David Kangas also revealed that the actress Nathalia Ramos, who plays the "House Of Anubis" character 'Nina Martin', will be shooting her final scenes of the second season of "House Of Anubis" in January 2012. Season 2 is coming we promise! Been filming 6 months now, seems like a long time, but its because we're making sure it's good for you guys!